Hello and Happy Tuesday! I just returned from a 7 day cruise and am super rested and ready to make this a great week! We went to St Thomas, San Juan, Half Moon Cay, and Grand Turk! Being grateful for the opportunity to go on a vacation to so many beautiful places made this week's Stamp, Ink, Paper theme absolutely perfect for me! 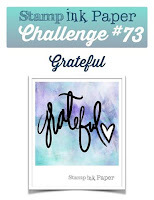 I decided since my card fit the challenge that I'd also link it up in The Paper Player's Challenge Thankful Challenge! It's always a good thing to Count your Blessings, right?? My first thought was to use the new Posies and Paisleys stamp set but then I decided to pull out a retired set from Last Year's Holiday Catalog called "Lighthearted Leaves". I started with a 5 1/2" x 8 1/2" piece of Wild Wasabi Cardstock, scored at 4 1/4" to make an A2 Cardbase. My top layer was Watercolor Cardstock that measured 5" x 3 3/4". I heat embossed the leaves from the Lighthearted Leaves stamp set with gold embossing powder. I then used Real Red, Wild Wasabi, Pumpkin Pie, and Daffodil Delight Inks and my Aqua Painters to watercolor the leaves. Once dried, it was backed with a 5 1/8" 3 7/8" piece of Real Read Cardstock. and then mounted on the Card Base. The sentiment (also from the Lighthearted Leaves set) was heat embossed in Gold on another small piece of watercolor paper. I used my Layering Circle Framelits to cut it out and then backed it with a Real Red scallop circle cut from the same framelits. I had some Gold Metallic trim that I looped and applied to the card front with Dimensionals and then added the sentiment over that.